The choice of threading material is particularly important when using gemstones. Each material has its advantages and disadvantages. Strength and flexibility are the two most important properties. It may be possible to achieve good results with other stringing materials, but these are the 5 options which I have tested thoroughly and would recommend. The chart above shows how the choice of material will affect the size and shape of the braid. Each of the examples was made with exactly the same amount of chips. It is important to avoid chips and beads with particularly sharp edges. Most will be fine, but some very cheap stones can be a problem. Feel the hole with your finger. If it feels abrasive to the touch it will, in time, cut through virtually any threading material, including wire. The stones supplied by reputable suppliers will be up to the required standard. Be wary of very cheap stones because they may well be faultly. Flaws in the stone may not be unattractive, but badly cut holes will mean that the jewellery will not stand up to reasonable wear. Any of the stronger bead threads, such as Fireline or Wildfire, are robust and durable enough to be used to string good qualitly gemstones, particularly if the threads are doubled or tripled. However, they are too fine to be gripped firmly enough by the slots on the disk. If multiple strands and a specialist high tension disk are used, it is possible to use these threads on their own, but if a regular disk is being used then a thicker thread needs to accompany the bead thread in each disk. A densely packed, chunky braid with a fairly rigid structure will be produced, which is great for statement bracelets, but might be a bit too heavy for necklaces. Particular care needs to be taken to make sure that all the cords in the slot are pulled up evenly and have not got caught up on the chips. More chips per inch will be required than with other methods. 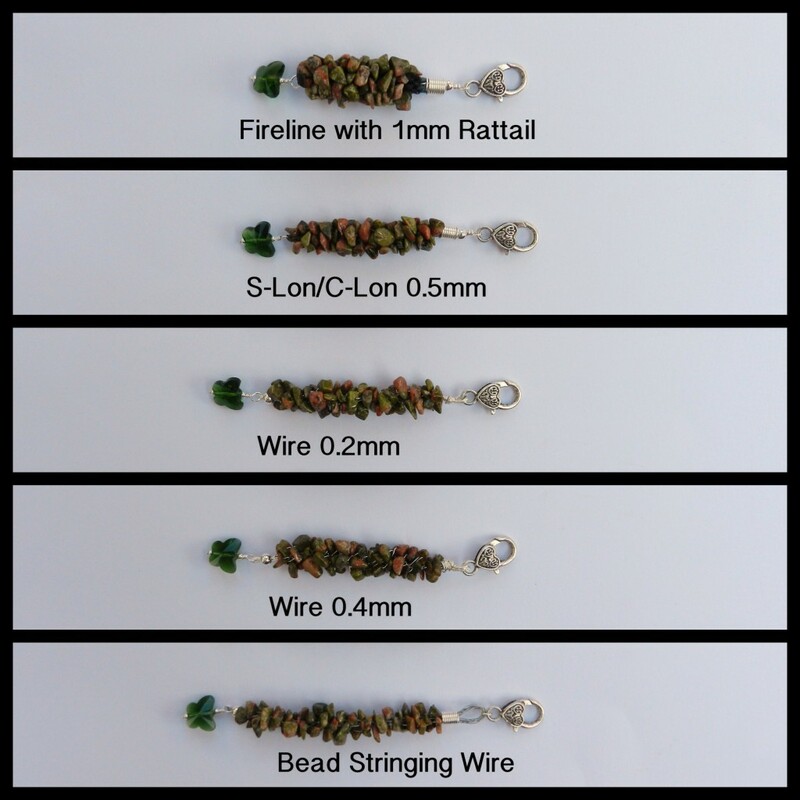 This is the most popular cord for use with all types of beaded kumihimo. It is very strong and should fit through the holes of most types of gemstone bead, especially chips and rounds. The ends can be stiffened with a coating of nail varnish to aid threading. Avoid beads with sharp edges for this cord. A densely packed, medium width braid with good flexibility will be produced, which is excellent for all purposes. To make a stiffer, chunkier braid use an extra cord in each slot, or alternatively make a 16 warp braid with beads on only the 8 cords on either side of the dots on the disk. Wire within this range is easy to use for gemstone kumihimo. Make sure that wire produced specifically for jewellery making is used. It is very easy to thread the stones onto the wire and the finer width is the best option for very small holes. However, very sharp edges on poor quality stones can even cut through wire. Beware of overworking the wire because it will stiffen and snap. The stones will be more widely spaced with wire than with thread or cord. The thicker the wire, the more widely spaced the beads will sit in the braid. This is particularly effective with the more translucent beads and fewer beads will be needed to complete a design than with thread or cord. The wire will be visible in the braid, so interesting effects can be achieved with coloured wire. The thicker will be more visible than the thinner wire. It is easy to finish off and secure the braid by simply twisting the ends together. This multistranded coated wire is the most durable of all the threading options and the one which is most likely to resist slightly sharper edges to the holes. However, a really sharp edge can still cut through this type of wire in time. It is easy to thread on the beads and fits through tiny holes. The braid will be very widely spaced and springy. Coloured wires can be used to make a feature of this property. The wide spacing means that fewer beads are required to complete a design. It will unravel extremely quickly, so great care needs to be taken to bind the wire once it has come off the disk. It is best to use a combination of binding and gluing (use Superglue).